Commercial Open Source applications providing an unparalleled feature set that enables you to work efficiently and productively. 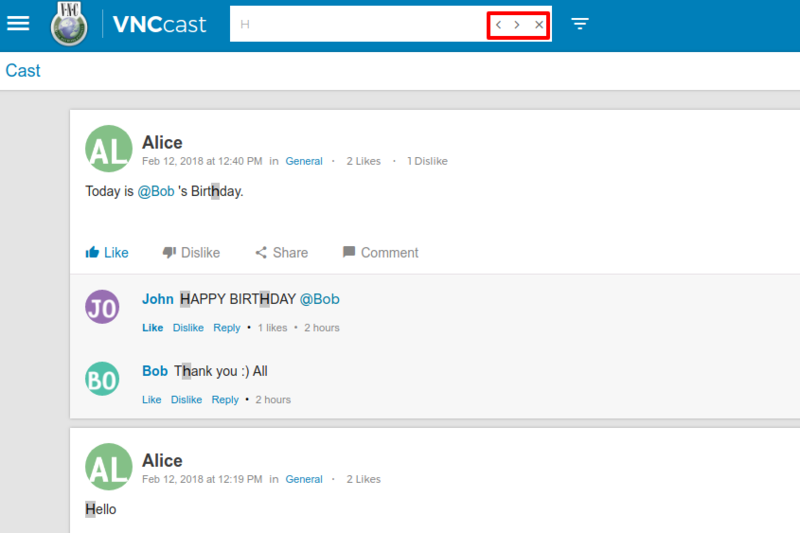 The VNCcast is your safe social intranet for fast and effective communication. Add new topics to the cast (depending on access rights). Post new cast messages to the selected topic(s). Interactions like comments, sharing, like and dislike on cast messages, reply to cast messages and cast comments as well. Hamburger Menu: By clicking on the "Hamburger menu" you can access other VNC services like VNClibrary, VNCcast, VNCstream. Add Option: Click on the Plus button to create a new Cast Topic or Cast Message. Toggle Sidebar: With using this tool you can expand or hide the sidebar. Feedback to my Post: With the "Feedback post" button, you can display all cast messages and comments you wrote or were mentioned in. Search: The search bar allows you to search for any keyword. The search performs in the entire cast screen area which includes comments and messages as well. Advanced Filter: You can filter the search results by using several parameters like Topic, Cast item, Date range or Author with these buttons. User Profile: Here, you can check or change your profile photo or you can log out from the current session. Notification: Here you can find the latest notifications about new content. Cogwheel: By clicking on the cogwheel icon you can access the general settings of the application. By selecting VNCcast from the hamburger menu, you will be redirected to the VNCcast page. By default, all cast messages are displayed on the main page. The main page also provides some basic details for each cast message like Cast type and the number of Likes and Dislikes. The "Plus sign" icon in the bottom-right corner of the main page provides the action to 'Add Topic' and 'Add a cast message'. Only users with the necessary access rights will be able to add a New Topic. 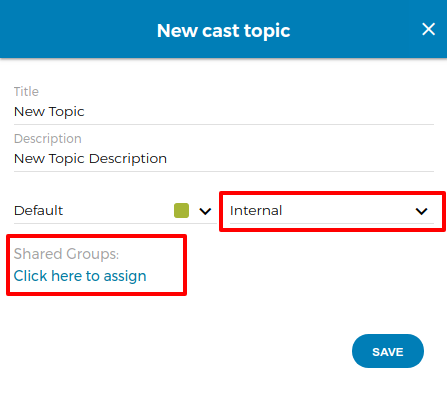 When you add a New Cast Topic you have to fill in a few relevant details, like Topic Title, Description, Cast style, Share type(None, Public, Internal) Please fill in all mandatory fiels, otherwise the Cast Topic cannot be crated. The selection of the share type "Internal" will give you access to the window add group. 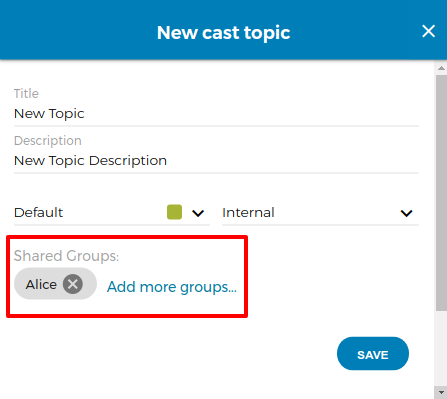 Here you can assign different names or groups who can access the new Cast Topic. In the Sharing window, you can search for usernames and groups. The search field will automatically suggest some contacts, the suggestions get more precise with every entered letter. 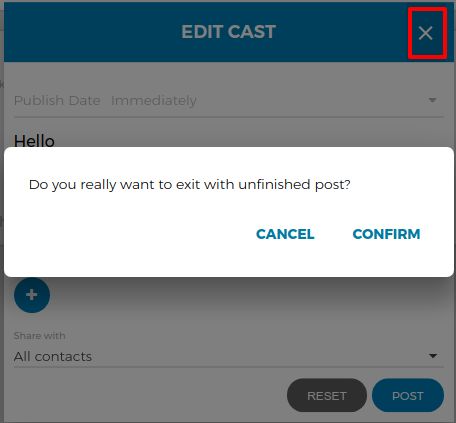 After you have selected all contacts for your cast message, you will get to the setting options to adjust permissions for every user. 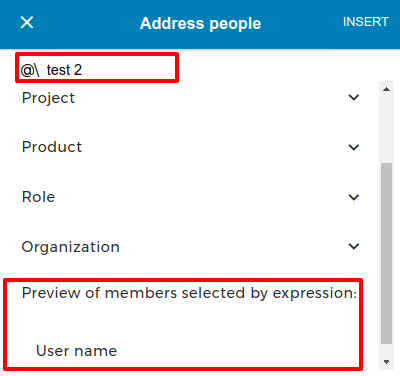 You can also mix groups and single users in case a certain user is not member of the selected group. By clicking on share the selected user(s) can be added to view your post. 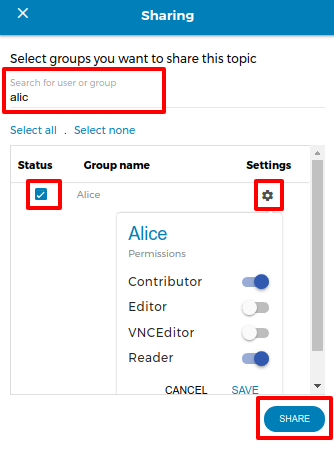 After you saved the preferences, the selected user(s) will be available in the Shared groups area of the New cast topic window. This option allows posting new cast messages. By clicking this button a small window will pop up, asking you for a topic, the publishing date, the cast message itself with different attachment types and sharing options. 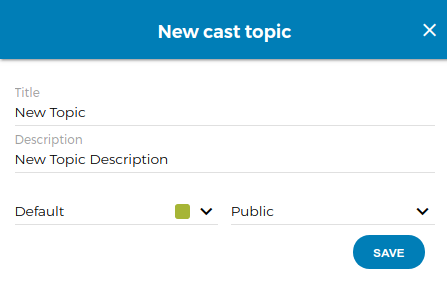 Selecting a Topic: By clicking the drop-down icon next to the topic option, the user can search and select the available Cast topics. 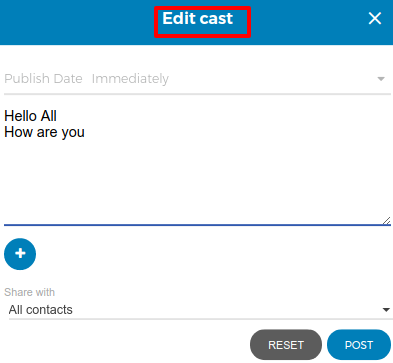 Publish Date: The user can select the specific date & time when the cast is published. By default, Immediately is pre-selected. Type Post: This is the actual composing window, where the user can write down the message he wants to publish. By clicking the Plus sign below the Type post composing window, an icon bar becomes available. This bar contains some very useful options to add more content to your cast message. The respective icon's functions are explained below, starting from left to right. 1.Attach Files: Here you can add files from your local device, like e.g. images, PDFs or text documents. 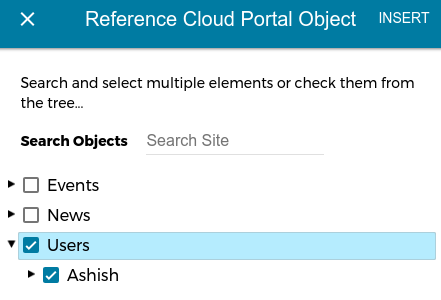 2.Reference Cloud Portal Object: Allows you to search and select multiple objects from the UXF portal (Events, News, Users and more) which will be added to the post. 3.Address people: Allows the user to address a group or specific users in the post. The users mentioned in the cast message (as a single user or group member) are notified via email if they have enabled the email notification setting. 4.Address participants: Here you can search and tag another participant in the post. 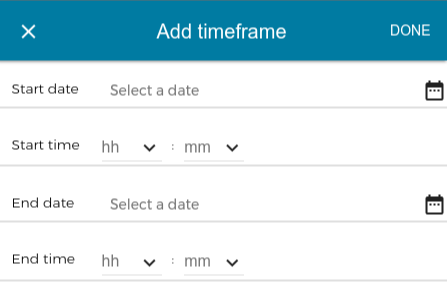 5.Add timeframe: Allows you to specify the time frame for the comment. The comment will be visible for the defined time frame only. 6.Hashtag: Allows the user to search and add tags to the post. The tags are an effective tool to get information on selected topics. You can click on the Hashtags and VNccast will display all cast messages which contain the same tag. 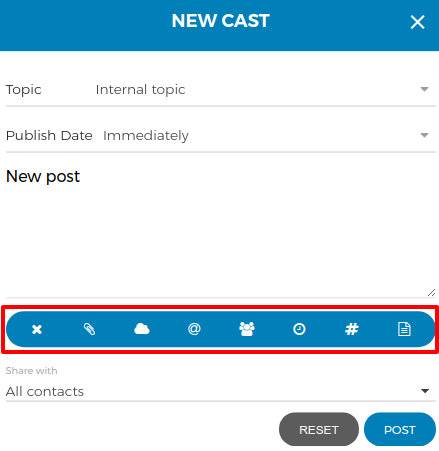 7.Attach Cast message: You can also search and attach any existing cast message of the same topic and add a link to that message in the post. Please note that only users with access rights can view the attached cast message. All options are also available for comments on an existing cast message. 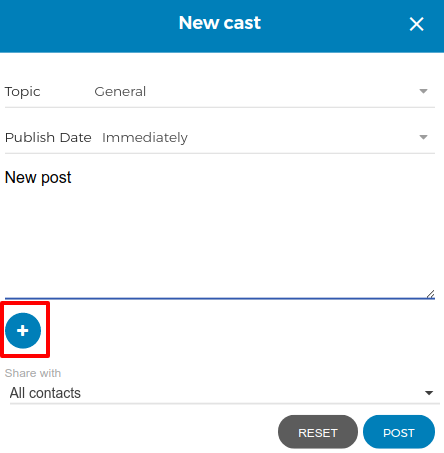 While composing a Cast message, you can decide to share it with all contacts or specific contacts only by clicking the "Share with" button in the bottom-right corner of the comment box. Clicking this option will open a popup window which enables you to choose whom to share your comment. There are Like, Dislike, Share and Comment buttons for every cast message. Like & Dislike: You can like or dislike a Cast message or comment, also you can see the total number of Likes & Dislikes. You can like or dislike a post by clicking on the respective thumb icon. Share: Allows you to share the cast message on social media platforms, like Facebook, LinkedIn, Twitter, etc. Sharing via social media works for messages with public sharing options only. Comment: You can add a comment to the respective cast message. Clicking the Eclipse menu icon in the upper-right corner of the comment box reveals a drop-down menu, containing a list of additional actions applicable to the respective comment. Note: The options Edit and Delete are only available for your own cast messages and comments. Allows you to change the content of the existing comment. After changing the content by clicking the close icon a new confirmation window will be displayed. Here you can select the confirmation option and then close the window. "Confirm" will leave the cast message or comment un-edited, "Cancel" leads you back to the create/edit window. Once a user has posted a comment via the cast window, the comment is visible in the selected topic. If you think that the comment belongs to another topic then you can change the cast topic by clicking on the eclipse menu shown at the right side of the comment window. 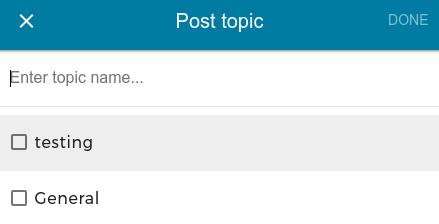 After clicking on the change topic button you will be asked to choose the new topic. Select the new topic and click the checkmark button to confirm the new topic. 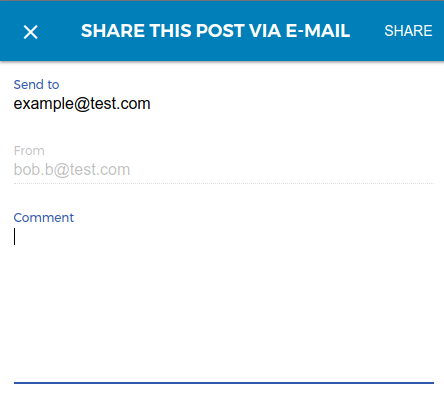 With Email to friend you can share the comment via an E-mail ID wrote in the send to field. 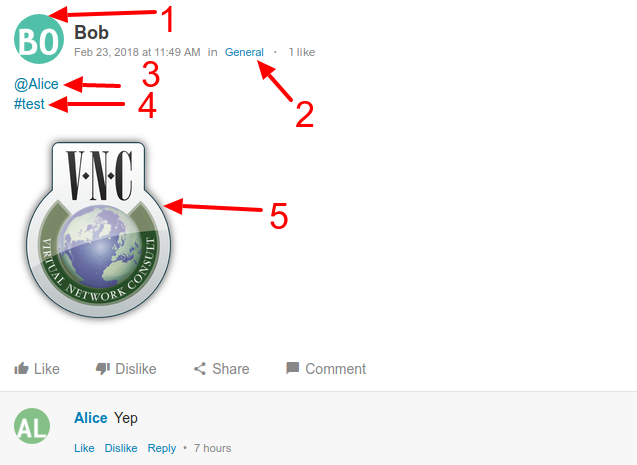 You can also write additional comments while sharing in the comment field. Please note that your contact needs access rights to view the message. Missing access rights on the cast message avoid acces on cast comments also. Clicking on this option allows you to follow a particular cast message. In this case you are notified about new comments and interactions. Clicking on this option allows you to open a cast message in a new window. Clicking on this option copies the current cast message or comment URL. The Delete tool removes your cast message or comment. You have to confirm you choice in case ypu clicked the delete button accidentally. You can click on the Reply option on any comment. This allows structured discussions for single cast messages. Several other options for commenting a cast comment become available when you click on the"+" icon. Clicking the menu icon in the upper-right corner of the Nested Comments box reveals a drop-down menu, containing a list of additional actions applicable to the respective comment. 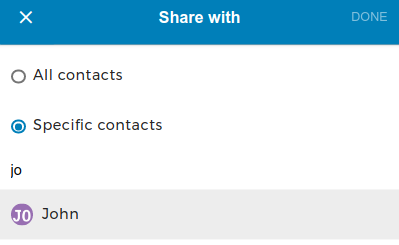 While composing a comment, you can decide to share it with All contacts or Specific contacts only, by clicking the "Share with" button in the bottom-right corner of the comment box. Clicking this option will open a popup window which enables the user to choose whom to share the comment too. 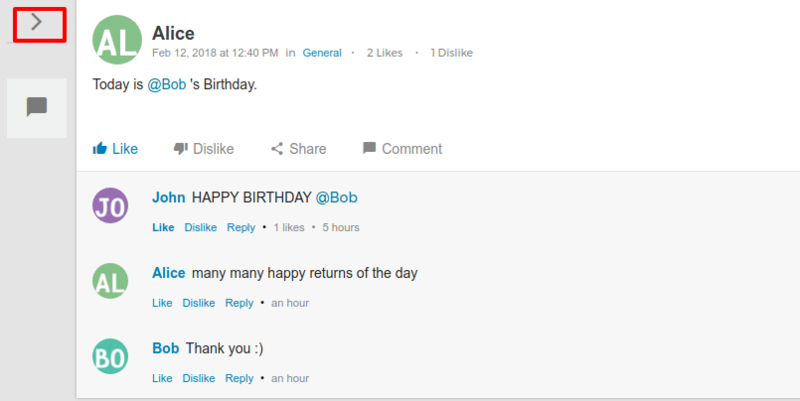 If there is more than one comment on a Cast message, the page will reflect only the first comment and displays the number of additional replies to that message in the bottom-right corner of the message box. These additional comments are displayed by clicking on "View more comments" button. 1.Avatar: With a click on the avatar icon you will get to the view profile button. This button leads to the selected user profile. 2.Topic filter: Clicking the topic of the message will show the whole cast topic with all cast messages in it. 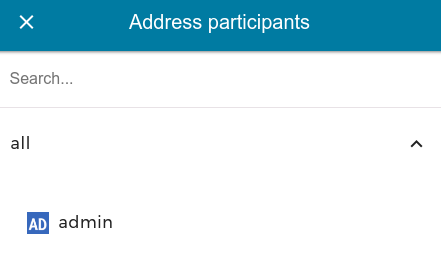 3.Address participants: With a click on the addressed participant or group name VNCcast will display either the user's profile or the member list of the group. 4.Hashtag: You can click on the Hashtags and VNccast will display all cast messages which contain the same tag. 5.Image: Clicking on an image in the post will open the image preview with the options to view the image on full screen or to download it. Clicking the ">" icon just above the Feedbacks option will expand the sidebar, displaying all functions at once. Clicking on Collapse Sidebar hides the bar again, leaving only the respective menu icons for display. All posts: By clicking on this option you can see all Cast posts. My posts: By clicking on this you will only see you own Cast postings. Posts were I'm involved: By clicking here you can see all postings where you were mentioned by other users. You can search for any keyword you like. The search functionality will highlight the results in the content of the messages or comments. To close the search bar just click on the cross button on the right side of the search bar. You can filter the cast message content by various criteria. By clicking on the filter button, you will be asked for the topic. 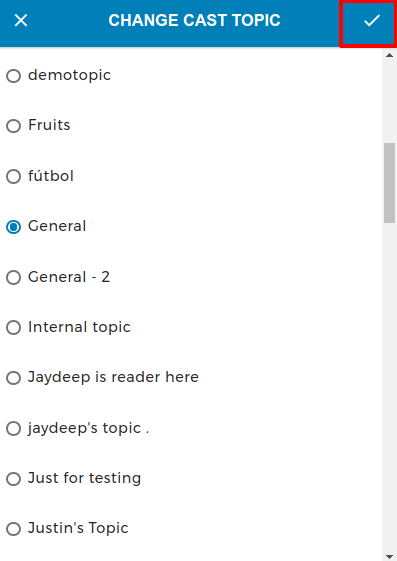 After selecting a topic you can add keywords to the filter. 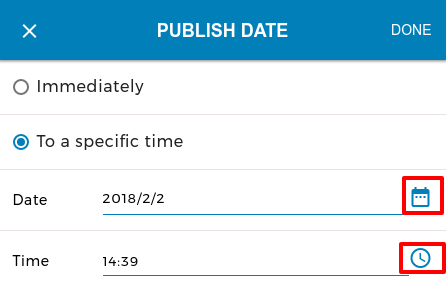 You can also filter the content in particular date range. By clicking on the apply button filter will be applied.